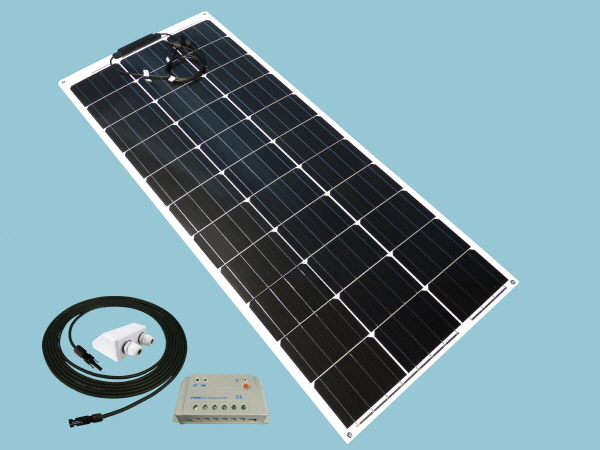 With a Sunshine Curve 100W 12V Solar Panel Kit you could expect to generate around 28 amps per day when used in conjunction with the Single Battery Controller supplied with the kit as standard. This figure is the same when used in conjunction with the upgrade option of a Dual Battery Controller, however the MPPT Dual & Single Battery Controller upgrade options offer 10%-30% more solar power generation depending on the solar panel specifications, in short the higher the solar panels open circuit voltage (Voc) the harder an MPPT Controller works to maximise the power generated with this Flexible Curve 100W this equates to around 33 amps per day with an MPPT solar controller during the summer months. This Sunshine Solar Flexible Curve Kit includes a single battery charge controller for one battery bank as standard with the option to upgrade to a dual battery controller for optimised battery charging of two battery banks. Our MPPT versions are perfect for those customers wishing to maximise the solar power generated. The Sunshine Flexible Curve Solar range benefit from ultra pure silicon delivering optimal power conversion. A solid copper foundation adds massive strength and prevents corrosion. Being thin, light and when fitted to the roof of a caravan or motorhome very aerodynamic. Light weight design combined with high efficiency cells and a 20° solar panel flexibility makes our flexible solar range perfect for caravans, motorhomes and boats. Don't forget the add-ons to compliment this kit such as the Remote Meter, not only does this give valuable data about the overall performance of your solar panel it also gives info on the battery state of charge and makes setting up the system easier.